Tell Me Three Things is engaging, ravishing and bewitching book. Once you start reading, it will be hard to stop, and that's what happened to me, I got really hooked! No matter how busy I was with work I will end my day reading this until I get really tired and it's hard to open my eyes anymore. The way the book was written is very catchy! The title will make you curious why it was made like that, what are the three things? (right?!) and then the cover was simple yet in a way where you will still pick it up no matter how many books are around you. Jessie is a high school girl who lives with her dad, step mother and step brother after her mother's death. She feels alone and abandoned in her new place but then she received an email from somebody who named him/herself as Somebody/Nobody (SN). SN, is a simple person who secretly look after Jessie. The person who helped Jessie find a new friend and the one who helped her with other things around school. Two people who met online and became best friends. Identity might be hidden but both are concerned with each other. *Squeal! * I LOOOOOVEEEE this book! It's really worth reading! Jessie and SN's story is so beautiful and inspiring! At some point it is cute to have someone looking out for you though some people might think it is creepy nowadays (LOL). I think, Jessie is lucky enough to find SN or SN found her anyhow, SN has been her savior from the things she experienced around her. Also this book is swoon worthy!!! I do recommend this book to readers who would want to read something light yet enjoyable. I'm thinking of other things to write here, to be honest it was really hard! I just can't put the words. I can't think of the matched sentences or words for this book. I simply love it. If somebody will ask me if I will read it again? 110 percent I WILL! I want to thank the publisher for sending this copy to me in exchange of an honest review. I am honored to be part of this blog tour. Soooo thank you very much for this! Please check out my two novels, THE OPPOSITE OF LOVE and AFTER YOU, both now out in paperback. 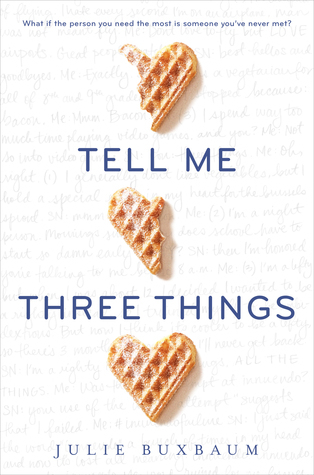 My first YA novel, TELL ME THREE THINGS, debuts April 2016. 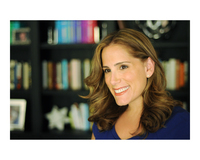 Please check out my website www.juliebuxbaum.com for more information about my books. One of my favorite things about being a novelist is the opportunity to talk to reading groups. If you are part of a reading group and would like to set up a conference call, or maybe even a meeting in person, please check out the reading group form and the reading group guide on my website.